Tea Party groups who were illicitly targeted for heightened scrutiny by the Internal Revenue Service plan to sue the agency, even as its acting director resigns and the Justice Department considers criminal prosecutions. 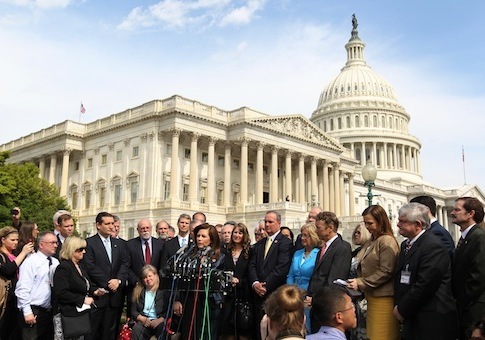 Members of a host of Tea Party groups gathered at the U.S. Capitol on Thursday to speak out against what some characterized as a near-dictatorial abuse of power designed to silence conservative voices. Jordan Sekulow, policy director of conservative public interest law firm the American Center for Law and Justice, said he will be taking legal action against the IRS in the next few days on behalf of groups that were improperly targeted. Seventeen ACLJ clients are ready to file suit against the IRS, he said. Those clients "suffered damages, they lost membership and donations, they missed the election cycle, they missed key moments, they were not able to bring speakers in," Sekulow said. ACLJ has demanded that the IRS take action on 10 groups whose 501(c)(4) statuses have not yet been approved. Lawsuits will be filed whether or not the IRS complies with that request, he added. "This is far from over, even if they do approve the remaining groups," Sekulow said. The impending lawsuits are the latest development in a scandal that has embroiled the administration since Friday, when IRS officials admitted they had applied heightened scrutiny to the tax-exempt-status applications of groups that used the words "tea party," "patriot," or "9-12," the latter a reference to a movement headed by television personality Glenn Beck. Conservative groups that applied for tax-exempt status were sent lengthy questionnaires that asked for extensive and detailed information about every facet of the groups’ operations. Some groups were even asked for lists of their donors. Others had to provide lists of all the books they recommended to their members. At least one group had to pledge not to protest activities by liberal political groups. Adam Brandon, executive vice president of FreedomWorks, said at Thursday’s press conference that the IRS’s actions make the American political system feel "more like a third world junta than a constitutional republic." President Barack Obama announced Wednesday night in response to last week’s revelations that he had accepted the resignation of acting IRS commissioner Steven Miller, though it was later reported that Miller was already scheduled to step down. Attorney General Eric Holder announced that the Justice Department will investigate the IRS and pursue criminal charges if warranted. Members of Congress hammered the IRS for these apparent abuses at Thursday’s press conference. "There’s something profoundly un-American about targeting your political opponents," said Sen. Rand Paul (R., Ky.). "Someone needs to be held responsible. Someone needs to be imprisoned. Someone needs to be prosecuted." Senate Majority Leader Mitch McConnell (R., Ky.) pledged "a complete and thorough investigation of this in Congress." "The truth will come out. It always does. It could come out sooner or later, but I guarantee that we will find out everything that happened," McConnell said. "This isn’t just an act of a Democratic administration attacking Republicans," explained Sen. Mike Lee (R., Utah). "It’s much, much more than that. This is an act of a political class in Washington, regardless of political affiliation, targeting the American people." Tea Party groups in attendance said the IRS’s actions would have a profound chilling effect on Americans’ involvement in the political process. "The damage the IRS has caused may be immeasurable," said Jenny Beth Martin, cofounder of the Tea Party Patriots. Beyond the "concrete, monetary damages" inflicted on these groups, Martin said, "there are groups of individuals who collectively gave up petitioning their government, and others who never even attempted to apply for tax-exempt status because they saw what other citizens were enduring." "How do we measure the impact of a public who is rapidly losing faith in the IRS in its ability to impartially apply the law in a fair and equal manner to all citizens?" she asked. A loss of faith in the IRS, others suggested, affects not just Americans’ abilities to petition their government, but questions of health care policy, given the extensive role the agency will play in implementing and enforcing the Affordable Care Act, also known as Obamacare. "I’m quite worried about the privacy of medical records," said Paul, a former physician. "I’m quite worried that your medical records will be evaluated by an IRS that seems to have the ability and seems to have the penchant to use political persuasion to search out political opponents," Paul added. Rep. Michele Bachmann (R., Minn.), a former IRS attorney, was even more explicit in her concerns. "It’s very important to ask, and now it is reasonable to ask, could there potentially be political implications regarding health care—access to health care, denial of health care—will that happen based upon a person’s political beliefs or their religiously held beliefs?" Bachmann said. "This question would’ve been considered unreasonable and out of bounds a week ago," she noted. "Today, this question is highly relevant." Those concerns could be heightened by allegations that the IRS illegally stole 60 million medical records from a health care facility in California in 2011. This entry was posted in National Security and tagged IRS, Michele Bachmann, Mike Lee, Obama Administration, Rand Paul, Tea Party. Bookmark the permalink.